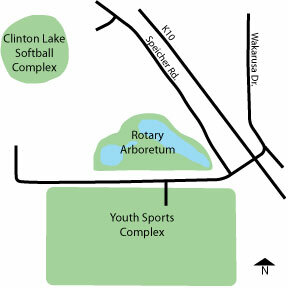 The Lawrence Rotary Arboretum was conceived in 2003 and dedicated in 2005 as a Rotary centennial project. Three, local rotary clubs, Lawrence Rotary Club, the Jayhawk Breakfast Rotary Club and the Central Rotary Club came to together for the centennial celebration of the of Rotary International with a donation for a waterfront gazebo. The idea was conceived to create an arboretum with new trees, identification markers, and two different gardens. One garden is a WaterWise® demonstration garden for educating citizen, which feature native pollinator plants. A second garden is a certified Monarch Watch Waystation, which provides habitat to butterflies. Additional projects, such as a performance stage, bike path rest station and Westar Pergola were completed by local scout troops and other volunteer groups. An inventory of trees was developed through the department’s use of TreeWorks™ mapping, using GIS to develop an ESRI story board, resulting in the creation of an electronic, interactive and self-guided tree tour of the Lawrence Rotary Arboretum. In 2010, George Woodyard, who lead the Rotary fundraising effort to build the arboretum, and his wife Eleanor created the Eleanor and George Woodyard Anniversary Garden in celebration of their 5oth wedding anniversary. The garden area features a couple of Pergolas and a rose trellis and benches over looking a pond area. To see the ESRI story board, which provides an interactive map with information on the inventoried trees of the arboretum, please visit: http://lawks.us/2xCmOih. In 2017, the Lawrence Rotary Arboretum received arboretum accreditation through the ArbNet program at a Level I status. ArbNet is an interactive, collaborative, international community of arboreta. ArbNet facilitates the sharing of knowledge, experience and other resources to help arboreta meet their instructional goals and works to raise professional standards through the ArbNet Arboretum Accreditation Program. The accreditation program is sponsored and coordinated by the Morton Arboretum, in cooperation with the American Public Gardens Association. and the Botanic Gardens Conservation International. The program offers four levels of accreditation, recognizing arboreta of various degrees of development, capacity and professionalism. Standards include planning, governance, public access, programming and tree science, planting and conservation. You can find more information about ArbNet at its website. A wonderful view of the arboretum, pergola, garden and pond. A small stage is also near the gazebo, as well as a small stream with cascading waterfalls. The Gazebo at the Rotary Arboretum has a capacity for 6-10 individuals. There is an area designated for butterfly habitat in conjunction with Monarch Watch. Reservations for outdoor shelters and indoor facilities are taken at any of the community recreation centers including the Community Building, 115 West 11th St.; East Lawrence Recreation Center, 1245 East 15th St.; Holcom Park Recreation Center, 2700 West 27th St.; Lawrence Indoor Aquatic Center, 4706 Overland Drive and South Park Recreation Center, 1141 Massachusetts St.
See our shelter rentals page for more information on renting these facilities or call 832-7920.